There is a rhetorical question that representatives of institutions and service providers continually ask parents of autistic people. My husband and I first heard it at an IEP meeting when our son was four. It is a two-part question. 1. What kind of a future do you see for your son? 2. What will you do with him when he's 21? This line of inquiry is meant to build up faux hope as we parents are supposed to be mourning for our autistic offspring as Edgar Allan Poe mourned for his lost Lenore. Then they lay out their Hobson's choices. "Does your son like trucks?" They asked, not really caring. "He likes watching construction vehicles in action," I answered, wondering where this was going. "Well, maybe we can train him to be a garbage collector." At another meeting, I answered the rhetorical question with, "He loves to sky watch by looking from his picture window on days of inclement weather." Their response was "then he'd make a great janitor." His father and I stared at one another in shock, wondering what one thing had to do with another. At one point I tried to discuss his strengths. "He likes lining up particular things. When he was a baby I used to give him plastic juice bottles filled with water dyed in rainbow colors and he'd line them up to look exactly like sunlight refracted through a prism. It amazed us." Their answer? "Oh, he's a trainable [insert r-word] that's great." "He can be taught to collect shopping carts and maybe even stock shelves." 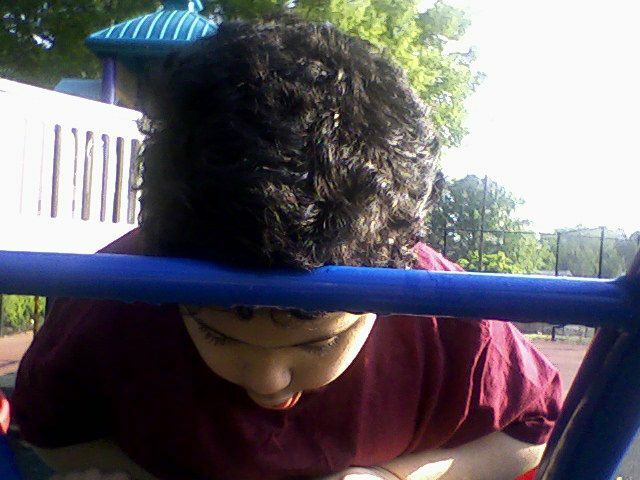 Because he's a nonspeaking autistic. Nonspeaking, to them, always equaled nonthinking. They don't actually listen to what you are saying. They don't actually see your children's worth when observing them. Their one-two punches, the rhetorical questions followed by their Hobson's choices are part of a myth that nonspeaking autistic people have no future. Their personal bias morphs into the professional opinion that they can't conceive of living without verbal speech, or navigating life with a combination of no verbal speech and intellectual disability so it is not possible. Very recently I was asked the "what do you see your son doing in five years" derivative rhetorical question. I had to bite my tongue. I wanted to answer "I see my son continuingly chemically altering his RNA to adapt to changes in his environment, the way cephalopods do." Or "I see my son as the first nonspeaking President of the United States." I really considered just giving one of those two answers and watching that interviewer's face as they tried to process what I had just answered. I'm tired of the entire "your son has no future so here are your Hobson's choices that you need to pay for" circular rhetorical question thing. To counter it, I thought I'd discuss my real view of the possibilities for a community based, minimally invasive, autonomous life for my son after he grows up and as he ages in a series of posts beginning with this one. From our parental perspective, we see that since our son's diagnosis, technology has directly and repeatedly improved the quality of his life and therefore our lives as well. This means future planning choices being presented as his only options right now won't be valid when he's 21 and therefore should keep changing even as I type this article. What bothers me is that the historical structures built to advocate for autistic stakeholders are heartbreakingly slow to keep pace with the technology that changes how we are all living. 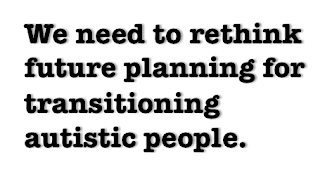 That means those offering choices in future planning for nonspeaking autistics fail at the job of providing modern solutions in assistive technology, accommodations, and supports meant to truly include nonspeaking autistic people in communities of the future. Structural ableism and a hierarchy of disability bias against nonspeaking autistic clients are firmly sitting in the way of achievable solutions. Particularly in autism services, solutions that allow nonspeaking autistic children and adults to leap forward don't come from established channels, they come from completely new directions. Before the iPhone and Proloquo2go AAC, a Dynavox or similar AAC device was not affordable for nonspeaking autistics of color without a source of funding such as Medicaid. Most schools, therefore, rejected the urgent need for students like my son to be taught to use AAC devices and generally offered only minimal speech supports, despite the clear fact that ability to communicate is the primary challenge of a nonspeaking autistic pupil. Apple's mass production of iPods and iPads began the first steps to communication rights for nonspeaking autistics in particular. That is a transformative change in one major aspect of autistic assistive tech that no one in the service provision or professional service industries saw coming. Education pathways for nonspeaking autistic students are stagnant because school administrations don't accept that nonspeaking autistic students have learning potential. We have the technology and the infrastructure, as shown by Khan Academy, Open Courseware and things like audio book services, as well as other free or low-cost quality online education models, to offer nonspeaking students lifelong learning possibilities to challenge and stimulate their minds wherever they live if they are given online access and the effort is made to adapt the learning to provide accessibility. This education enrichment, with goals to prep for everything from a literacy certificate to GED certificates, and even certifications in things that interest them in post-secondary education, are never offered as goals for nonspeaking autistics trapped in an education system that does not allow them to graduate at 21 with a high school diploma. No option to keep learning exists in the Hobson's choice of future planning. Financial pathways do not plan for future banking technologies or how our offspring can be prepared to manage funds. It is simply assumed that we have no choice but to put our children's financial future in trust, in the hands of attorneys and hope those attorneys don't turn out to be like disbarred lawyer Julie Kronhaus, who embezzled $1.5 million dollars from multiple clients' trust funds, including a disabled young woman whose family had won a settlement and put the money in trust for her care. Trusts are the only choices given us. We are simply supposed to accept that this is the only solution available to transitioning nonspeaking autistic adults. Yet we are nearing the end of the age of paper money, and as financial institutions rush to get the technology necessary to produce legal tender similar to Bitcoin, and Amazon is changing the way we shop such that a cash register is no longer necessary and food deserts can be overcome with an internet connection, disability service organizations and service providers continue forcibly pushing future financial solutions that increase risk of theft or fraud. Community housing pathways always seem to default to group home placement after the passing of parent care providers and this means that autistic adults who may have never been in a group home situation in their lives are suddenly removed from their own homes and placed in institutional settings when technology makes such an action expensive and completely unnecessary. No one considered changing laws so that estates inherited by nonspeaking autistic adult offspring can be future planned and adjusted for direct to service in-home care that is minimally invasive and keeps the disabled adult seamlessly in the family home that they know how to navigate and are accustomed to. No one has considered developing smart home technology to assist in keeping orphaned autistic adults in their homes for the remainder of their lives. No one thinks of high-tech micro-housing as a safe and affordable community living option for nonspeaking autistic adults. That would take work, foresight, caring about their clients. Unfortunately, independent parent driven community living models are basically private institutions, complete with prison guard-like security staff and the traditional highly invasive staffing for care, like this example from North Texas. I do not support traditional group home or full on institutional housing models being independently built by an increasing number of affluent groups of parents. I am saying we autism parents are acting against the basic principles inherent in the Olmstead Decision with these horrific housing options when what we should be working on are options like minimally invasive, community integrated solutions for our grown children. Just because we are building it doesn't mean it is any different from any other mental institution, even if parents with the best intentions create it. We need to rethink future planning for our transitioning autistic people. We need to start thinking about what senior care looks like for aging autistic people who have the human right to continue to live in the communities they've spent their lives in after those who were their lifetime care providers pass away. And I'm sorry, that is not throwing them in custom built groups homes or private mental institutions with guards and staff. In 2010, the first MedCottage, a smart home for senior care as an alternative to nursing homes, was rolled out and marketed. These pods are far from perfect, but they demonstrate that when we are considering solutions for transitioning autistic offspring or aging autistic siblings who might require intensive supports, we need to push boundaries beyond the Hobson's choices offered us and fight for Olmstead decision compliant adaptive housing options like these pods that keep our loved ones in our families and in our communities as is their human right. We need to leverage existing technology and develop assistive technology solutions that expand future planning options for autistic people. This begins with expanding our thinking about what our autistic loved ones can do, how they can live included in society rather than isolated, guarded, and invasively managed distantly from it. Begin with pushing back against the tide of gaslighting professionals and service providers forcing Hobson's choices of no-future so institutionalize myth on us. My son, like any young adult, will be able to own a car, because driverless cars will be in mass production and one will be adapted to his needs, to take him directly to and from his daytime appointments to home based on his schedule. Emergency locations will be there for him to choose from a touchscreen device should he feel unwell when entering the vehicle. 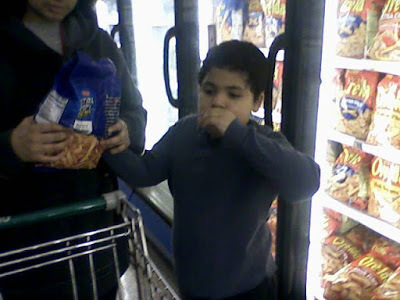 My son will have a job in something he's interested in, even pushing shopping carts, not because someone decided that is all he's good enough to do, but because he is motivated, interested, and has the will to do that work. My son will be housed in a minimally invasive, smart living space that he will be able to live in and manage as autonomously as possible. The bathroom will be self-cleaning. The floors will be cushioned to prevent broken bones in case of a fall, and they will be maintained by cleaning bots. He will be able to prepare prepackaged healthy meals in a microwave that will sense what kind of food is in it and cook said food without the need for pushing additional settings. The microwave will not open until the hot food cannot burn him. He will also have a smart refrigerator that knows when groceries are needed. A plan will be in place to ensure at home supports are provided as he transitions so that in the event that one or both of us, his parents, pass away, he will be able to remain in that home without interruption and he will already have what support staff is needed in place to care for him. He will not need to have cash around nor will any staff have access to payment systems or funding. Grocery, household goods, clothing, will be sent as they are needed through buying habit bots determining when such things are in need of replacement and will be paid for without money changing hands. The house will be powered off the grid and therefore bills will not be an issue. A non-gasoline backup generator will come online in the event of an emergency. The pod will be able to withstand high winds and be equipped with a sprinkler system in case of fire. Outside meals will be purchased from an interactive touchscreen device not requiring verbal input and paid for prior to leaving so food can be either eaten at the location, picked up and brought home, or delivered without money changing hands. Purchases for entertainment venues and social events will be handled the same way. Each day he will be able to log on to an education program and retain knowledge as well as be challenged with new learning goals and coursework. This will continue at his pace for the rest of his life. No disabled person should live in poverty simply because they have transitioned to adulthood. This is the future for all disabled adults as it is meant to be. Make that future happen, don't fight for less.